The Red Shoelace Killer in post-production! 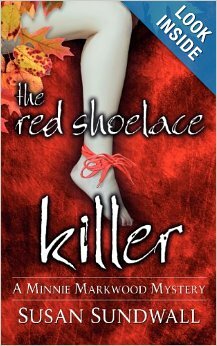 Lee Ann is pleased to announce that the cozy mystery, The Red Shoelace Killer by Susan Sundwall, is now in post-production. The audiobook should be available in a couple of weeks on Audible. This book is the first in the Minnie Markwood mysteries. Minnie is 60-ish (she never says her exact age) has short steel gray hair and weighs ‘upwards’ of 170 pounds. She’s a widow and former librarian who now works part-time for a company that takes surveys. Minnie is a big fan of Agatha Christie books and the Miss Marple character from television. Minnie also loves her tea and her favorite candy, Taffy Tails. She considers herself pretty knowledgeable as an amateur sleuth and when the unsolved murder known as the ‘red shoelace’ killing, due to the red shoelace tied around the victim’s ankle, is suddenly in the news again, Minnie is ready to investigate. She ends up with two unlikely younger people as her investigative partners, Rashawna Jones — a pretty co-worker, and Rashawna’s new boyfriend, Joel, who works at The Dollar Tree in the mall where Minnie and Rashawna are taking surveys. These three suddenly find themselves being stalked. Is it by the killer and will there be another murder? Look for a post here when The Red Shoelace Killer goes on sale. Posted by lahowlett on March 16, 2014 in Uncategorized and tagged Audible, audiobook, cozy, cozy mystery, mystery, Susan Sundwall, The Red Shoelace Killer.